Filed to: Things and I mean THINGS!Filed to: Things and I mean THINGS! So, I've always asked about Cumberbatch vs Hiddles but let me ask, is that out-moded? 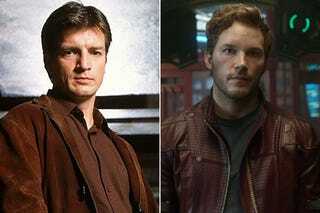 Should it be Chris Pratt vs Nathan Fillion and then who would you vote for? I'm gonna spend a couple hours being a functional adult and will look forward to hearing your responses. Also, for me, I'd vote for Juliette Binoche. And after that, then Timothy Olyphant and then after that Chris Pratt. And then Nathan Fillion and in a distant 100th, Hiddles. No Cumberbatch ever. Also, take this survey. I do want to hear the conclusions.